The Dream On Me Casco is a beautiful 4-in-1 mini crib with an attached changing table. This mini crib combo is great for smaller spaces. The mini crib features a three level mattress support and beautiful non-toxic finish. The changing table offers three roomy drawers for all your changing needs and a changing pad with security strap for added safety. The mini crib transitions from crib to a mini day bed to twin size bed (Twin bed rails and conversion post sold separately). The mini crib meets and exceeds all CPSC applicable standards. Accommodates Dream on Me 3 inch portable crib mattresses, sold separately. All tools for assembly included. Converts into a mini daybed and twin size bed. Twin Size Rail sold separately. Dream-On-Me-Casco-4-in-1-Mini-Crib-and-Changing-Table was received last week past the advised arrival date. I am pleased with the product even though it’s much smaller than what I was looking for. Perfect fit for my nursery. 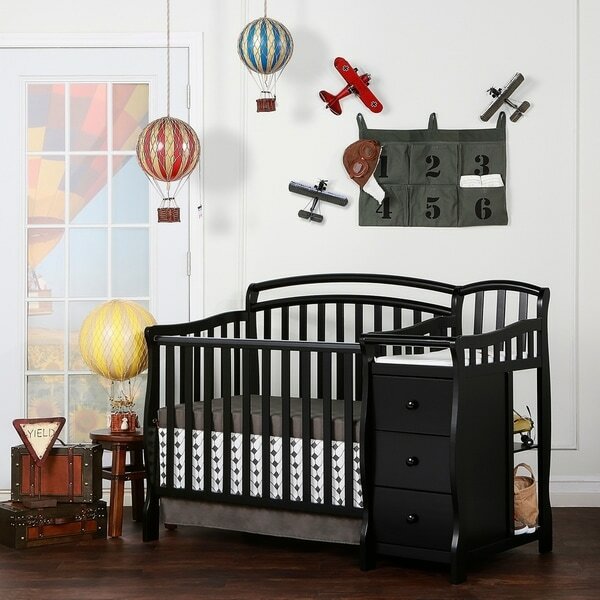 The room is small and this allows for the same style and function as a regular size crib for less space. The changing table and additional storage are really useful. This is a value combo we bought,a convertible crib and changer,looks really good in our nursery,assembly was easy,made of fine quality wood, worth for the bill. It’s a perfect size for a small room. I got it so we can have a crib at our house for my grandson. My son put it together pretty quickly. Looks great! Received with major scuffs and scratches on railings that take away a lot from what would be a beautiful crib. Very disappointed. The crib is nice but the parts were all the same, the crib overall is nice. Had to return it due to the drawers being all the same. "Do overstock sell mattress for this item?" Yes, we have a variety of crib-size mattresses. "Do this hvn a baby mattress?"